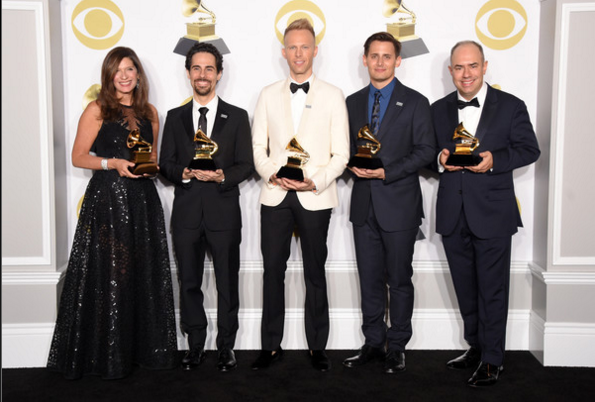 The Broadway cast recording of the Tony Award–winning musical Dear Evan Hansen won the Grammy for Best Musical Theater Album on Jan. 28. The album was produced by Atlantic Record’s President of A&R (artists and repertoire) Pete Ganbarg ’88, along with music supervisor and orchestrator Alex Lacamoire, creators Benj Pasek and Justin Paul, and Broadway producer Stacey Mindich. “The win gives Ganbarg his second Grammy for Best Musical Theater Album. Ganbarg won in the same category for Hamilton, created by and starring Lin-Manuel Miranda ’02, Hon. ’15, and directed by Thomas Kail ’99. Lin-Manuel Miranda received the Grammy award for Best Song Written for Visual Media for “How Far I’ll Go” from Disney’s Moana. The win marked Miranda’s third Grammy. He previously won the award for Best Musical Theater Album in 2015 for Hamilton and in 2008 for In The Heights. In addition, Gail Marowitz ’81 received a Grammy nomination Best Recording Package for singer-songwriter Jonathan Colton’s Solid State. The nomination marked Marowitz’s third nomination. She won a Grammy in the same category in 2006. For more on Pete Ganbarg ’88 and his career in the music industry, read “Ganbarg’s Greatest Hits” in Wesleyan magazine. For more on Lin-Manuel Miranda ’02, Hon. ’15 and Thomas Kail ’99, read “A Musical Revolution on Broadway” in Wesleyan magazine.